EMBELIA team will be at Cosmoprof in Bologna. We exhibit at PHARMAPACK,on february 06th and 07th 2019. 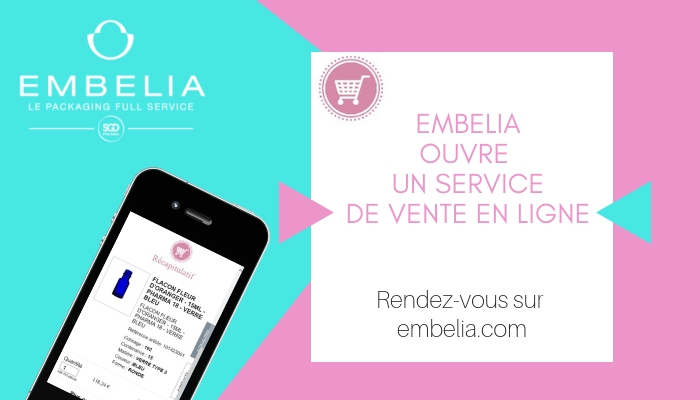 EMBELIA'S on line shop is now open for orders and deliveries in France. A range of Roll on with small or large ball offering wide choice of applications. You must have our Roll on in your makeup bag or in your travel kit. With its carriable nomadic format you can take it overall: at work, in town, on a trip …. EMBELIA commits in a sustainable development process and expands its flagships ranges : Classic & Douceur in GREEN PE. EMBELIA commits in a sustainable development process and expends its flagships ranges : Classic & Douceur in GREEN PE. EMBELIA exhibits at CPHI Madrid worldwilde from October 9th to 11th 2018. EMBELIA exhibits at CPHI Madrid from October 9th to 11th 2018.